Maisha Idris ’19 dreamed of attending college as a child, despite long odds. Her parents were immigrants from Bangladesh who settled in New York City. Neither graduated from high school. Both worked low-paying jobs. Valedictorian of her high school class in Queens, Idris was accepted at Rochester. Through scholarships and financial aid, she was able to enroll. But her first year was difficult. FIRST IN THEIR CLASS Keep reading to meet just a few of the first-generation students who are finding success at Rochester. The David T. Kearns Center, the University’s academic home for first-generation students, was a game changer for Idris. She met regularly with an advisor who made sure her studies were on track. She was introduced to the Center for Excellence in Teaching and Learning and learned better study skills. Last August, she received an Edmund A. Hajim Endowed Scholarship. Established by board chair emeritus Ed Hajim ’58, the scholarship is awarded to two engineering students per class who exhibit “academic strength, intellectual promise and innovative thinking.” She’s set to graduate in May and has a job offer in hand as a software engineer for Raytheon. Two months before Michael Lin ’21 was born, his family moved from China to Queens. When Lin was in the sixth grade, his father died, leaving his mother to support the family with a factory job. Lin was determined to enroll in college, but worried about the cost. The Alan and Jane Handler Endowed Scholarship, established by University Board Chair Richard Handler ’83 and his wife, Martha, erased those fears. The University’s leading award, its benefits include financial support, individual mentorship, and access to previous Handler Scholars. “It was a blessing,” Lin says. He struggled his first year but befriended fellow students in Tiernan Hall and resident advisors who became mentors. He joined Sigma Chi fraternity and UR Photography. He also is helping future first-generation students apply to college—a process he found “confusing and stressful.” He proposed a mentoring program involving Handler Scholars at East High School—part of the Rochester City School District, but managed in partnership with the University. Superintendent Shaun Nelms ’13W (EdD), who also teaches at the Warner School, accepted the idea, and the Handler Scholars are now part of East’s Step to College program, offering advice and hosting students on the River Campus. Idris’s story is striking, but not unusual at Rochester, where about 20 percent of undergraduates are first-generation, or “first-gen” students—those whose parents didn’t attend college. Several departments provide resources to help such students transition into college life, and a student organization offering peer-to-peer support to first-generation students was created last spring. Many students are aided by scholarships that lift the financial barriers that would otherwise prevent them from attending college. “We are committed to the success of our first-generation student population,” says Jeffrey Runner, dean of the College. She joined the dance group Ma’Frisah and found her “home on campus” at the Office of Minority Student Affairs. “Whenever I’m down, I know I can go there and see faces that will brighten my day and give me hope and motivation,” she says. Espinal plans to pursue a master’s degree leading to work that will better the environment. According to Maureen Hoyler, president of the Council for Opportunity in Education in Washington, D.C., Rochester has a distinguished record among elite private universities in supporting low-income and first-generation students. In 1965, passage of the landmark Higher Education Act led to the creation of the federal TRIO programs—outreach and student services programs funded by the US Department of Education to provide help for students from disadvantaged backgrounds. Rochester has played “a critical leadership role” in TRIO, says Hoyler. Jonathan Burdick, vice provost for enrollment initiatives and dean of Admissions and Financial Aid, has a message for first-generation students. Pech Chhun ’19 didn’t speak English when he left Cambodia for Rochester with his mother and sister at age eight—but college was part of the plan, if the financial resources were there. He enrolled in an International Baccalaureate program in high school and was named a Brady Scholar in recognition of his engagement in the Early Connection Opportunity program. Chhun became a resident advisor, a D’Lion, and a member of Debate Union. He also founded the student organization First Gen Society and serves as president. “I’m so proud of it,” he says. “I hope it serves students well for many years after I’m gone from the University.” Chhun will graduate in May. His sister, Pechrasmey, received her degree from the School of Nursing in December. Last fall, 22 percent of the members of the incoming class were first-generation students, the highest percentage in years. Burdick sees attracting and graduating first-generation students as a central part of the College’s mission. Few first-generation students can enroll at Rochester without financial support. According to a 2017 report from Insider Higher Ed, 27 percent of first-generation college students come from households making $20,000 or less. The University provides around $65 million annually in grants and scholarship to low-income undergraduates in Arts, Sciences & Engineering, opening doors that otherwise would remain closed. In some respects, Dulce Martinez Alarcon ’22 had a typical first day of college. She became a Kearns Scholar, joined SALSITA (Spanish and Latino Students in Training for Awareness), and signed up for the First Gen Society club. “Those clubs gave me an opportunity to meet people like me,” she says. The Kirschenbaum Scholarship, established by Robert ’70 and Ellen Kirschenbaum, supports undergraduates in the School of Arts &Sciences, with a preference for need-based students from Arizona. “It’s the reason I’m here,” she says. Martinez aspires to a career in law. At the same time, financial support alone is often not enough for first-generation students to make the most of their potential. In an age when affluent parents are increasingly tapping into their means and experience to help their children prepare for and navigate higher education, colleges and universities must have resources to offer similar support for students without those benefits. In 2018, a $5 million gift from Kenneth French ’78S (MBA), ’83S (PhD) and his wife, Vickie, came out of a recognition of the importance of academic, as well as financial, support. The couple established the KRFrench Family Scholars Program to provide financial aid and a robust network of academic support for College undergraduates with high academic potential and financial need. “Lost doesn’t begin to describe how I felt,” he says. “Everybody seemed to know where to go and how to get there.” His worries dissipated when he joined the First Gen Society, a student organization offering peer support to first-generation students. He was introduced to the Office of Minority Student Affairs and the David T. Kearns Center and went from feeling like an outsider to a member of the community. “UR has quickly felt more and more like my home,” he says. 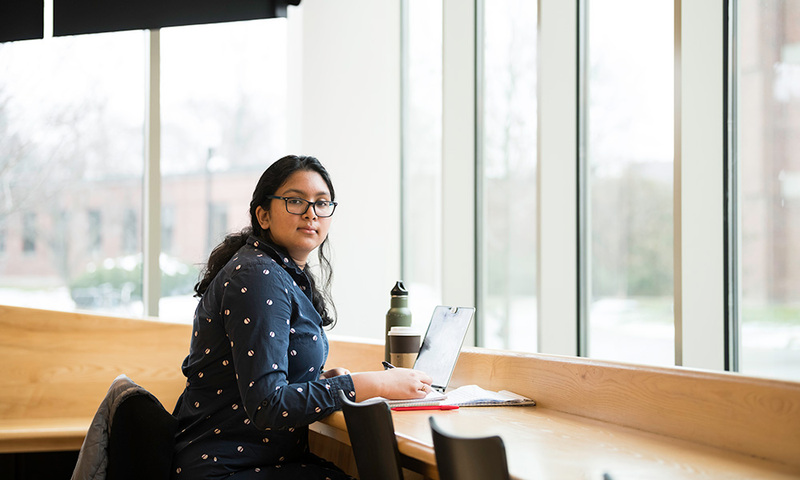 “I’ve found the right people to surround myself with and have become more comfortable with the campus and the city.” After graduating, Vera plans to take a gap year to gain experience and work toward getting into medical school. His career goal is to become an OB/GYN. “I’m fascinated by the idea of helping to bring life into this world,” he says. The Frenches will add significantly to a network of resources the College already has in place to serve first-generation students. Those resources lend confidence to other scholarship benefactors that their investment at Rochester will be a good one. Anna Gasanova ’20E began playing the viola at age nine and spent her final two years of high school at the University of North Carolina’s School of the Arts. “It gave me a pretty good grasp on dorm life, so I wasn’t that nervous about coming to Eastman,” she says. Her parents emigrated from the former Soviet Union, and her father died when she was four. She relied on close family friends, books, and movies to give her a sense of what to expect from college life. The Noble Hanson Scholarship Fund for Eastman students was established in 1993 by Karen Noble Hanson ’70, a life trustee who died last November. The Anne M. Braxton Scholarship Endowment was established in 2010 by her estate. “It takes away the worry and struggle and makes your dreams come true,” says Gasanova. Prudence Bradley ’88 (PhD) was a first-generation student who had a successful career in pharmaceutical research and development. She established the Prudence K. Bradley Endowed Scholarship for first-generation Rochester students with financial need with a preference for students pursuing degrees in STEM fields. Bradley recipient Marines Espinal ’21, an environmental science and American Sign Language double major who moved from the Dominican Republic to New York City when she was 10, was able to get a head start at Rochester through the Early Connection Opportunity program overseen by the College’s Office of Minority Student Affairs. Mouhamed Diakhate ’22 calls the KRFrench Family Scholars Program a “blessing.” Established last year by Kenneth French ’78S (MBA), ’83S (PhD) and his wife, Vickie, it benefits students with high academic potential and demonstrated financial need. Diakhate hopes to join the Black Students’ Union, Pan-African Students Association, and the Minority Male Leadership Association. Adjusting to college can be challenging for any student, and to some extent, the growth of services targeted at first-generation students is part of a larger expansion of academic and other types of supports for all students that’s now almost universal in higher education. But at elite private universities such as Rochester, first-generation students are especially vulnerable to feelings of isolation. Sometimes, they feel misunderstood by classmates from more affluent backgrounds. Being a Hajim Scholar has allowed him to focus on school, rather than stress about finances. “It’s allowed me to connect with people I otherwise would never have met,” he says. Ismail wants to continue his education in graduate school and eventually work with prosthetics, in the industrial or research fields. In spring 2018, Pech Chhun ’19 created a new student organization, the First Gen Society, offering first-generation students peer-to-peer support. “We thought it was important to have a group where first-generation students could relate to and support each other,” says Chhun, a clinical psychology and biology double major who moved from Cambodia to Rochester when he was eight. Chhun is a Brady Scholar, a scholarship program established by University Trustee Elizabeth Pungello Bruno ’89. Weekly meetings alternate between educational seminars on topics such as how to write a résumé to social events, such as painting pumpkins and a “Friendsgiving” feast. Scott joined the Black Students’ Union and was an Urban Fellow for the Rochester Center for Community Leadership. She maintained a local children’s garden and helped register city residents to vote. In 2017, the Susan B. Anthony Center awarded her the Dean Ruth A. Merrill Award, given to an undergraduate woman from Rochester who advocates for the region and participates in University and community activities that promote the well-being of Rochester residents. Scott plans to earn a master’s degree in library science. The tide turned when she was awarded the Carolyn E. and Jeffrey A. Stone MD Current Use Undergraduate Scholarship, established by Jeffrey Stone ’87, ’91M (MD) and Carolyn Stone ’87. “It showed me there are people who believe in me,” Morningstar says. She became a Kearns Scholar, then a research assistant at the Medical Center. Last spring, she was one of 13 Rochester students elected to the Phi Beta Kappa honor society as a junior. Last year, Chhun was speaking to students from the Rochester City School District about the importance of higher education when one of the students expressed his disdain for college. Chhun was taken aback but chatted with the student about the importance of a degree. The Office of Minority Student Affairs has supported the needs of underrepresented and first-generation students for 50 years. Through the Higher Education Opportunity Program and the Early Connection Opportunity program, OMSA introduces first-generation students to college through social events, seminars, and introductory courses, and partners with University departments to provide help with writing, study skills, and leadership training. “It’s critically important that we provide the type of support that helps first-generation students realize their academic and personal goals,” OMSA Director Norman Burnett says. The David T. Kearns Center has worked with first-generation students since 1992, when the University received its first federal funding for the Ronald E. McNair Post-Baccalaureate Achievement Program. The center is also home to other federal initiatives, including Upward Bound programs and the Talent Search, that often serve first-generation students. Melissa Raucci, first-generation coordinator, says 80 percent of the 119 Kearns Scholars enrolled in the fall 2018 semester were first-generation students. In addition to having access to study groups, workshops, and career mentoring, Kearns Scholars enroll in a one-credit course called Navigating the Academy. Three-fourths of Kearns Scholars go on to graduate school. The Office of Parent and Family Relations and the First-Generation Students and Families Committee host an orientation event each summer and created a website for families. In 2018, Parent and Family Relations initiated a program called Family Talk, where students chat in small groups with staff members from Parent and Family Relations and the University Counseling Center about concerns they might not be able to discuss at home. “We create a space for students to identify with each other and give them strategies for how they can have those difficult conversations,” says Parent and Family Relations Director Dawn Bruner, who was once a first-generation student herself. The First-Generation Students and Families Committee also sponsors a senior celebration for first-generation students, initiated the addition of the Gwen M. Greene First-Generation Senior Award as part of the Dean of Student’s Student Life Awards, and developed 1ST ONE, a campus community campaign to show support for first-generation students at Rochester. The First Gen Society, established in 2018, offers peer-to-peer support through weekly meetings alternating between educational seminars on topics such as how to write a resume, as well as social events, such as painting pumpkins and a “Friendsgiving” feast.